Peace be upon Muḥammad and His descendents! 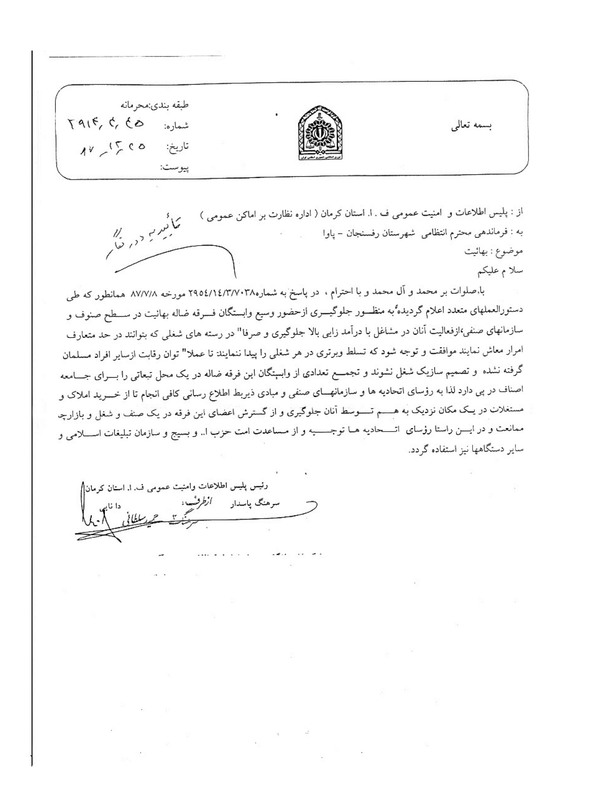 In response to [a letter] number 7038/3/14/2954, dated 8/7/87 [29 September 2008], as has been communicated through many instructions, in order to prevent the extensive presence of the adherents of the perverse Bahaist sect in trades and trade organizations, and their activities in high-income businesses, they should only be allowed to have enough income to survive, so that they do not obtain high positions in any business, take away competitive power from individual Muslims, and become the decision makers in a trade. The congregation of a number of the followers of this perverse sect in one area will have consequences for the trade business. Therefore, the heads of the unions and relevant trade organizations should be sufficiently informed to prevent them [Bahá’ís] from purchasing properties and real estate near each other in one location. The members of this sect should be prevented from having extensive presence in any one trade, business, or market place. The heads of the unions should be instructed on this matter and request assistance from Hezbollah, Basij, Society for the Promotion of Islam, and other organizations.